The future impact and longevity of community-based tropical forest protection will rely heavily on greater investment, the authors say. People in first-world nations can have a significant impact on reducing deforestation by practicing more responsible consumerism, according to Seymour and Busch. According to the authors, tropical deforestation generates a large share of global carbon emissions, which can be combated in part through investment via incentives from wealthy nations. Both of the authors are senior fellows at the Center for Global Development, a Washington, D.C.-based nonprofit organization that works to reduce global poverty and inequality. Seymour is an expert in political economy and environmental politics and Busch is an environmental economist. Seymour recently spoke with Mongabay via email about the book and its potential implications for the world’s tropical forests (one can also hear her discuss these topics on Mongabay’s biweekly podcast, here). 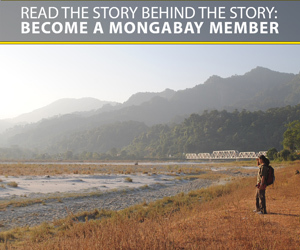 Mongabay: Why did you decide to write this book now? Frances Seymour: When we initiated this work now more than three years ago, our sense was that a number of factors were converging that could overcome barriers that had stymied previous attempts at international cooperation to conserve tropical forests. For example, new satellite-based data on forest cover change were just becoming available, and REDD+ negotiations bridging the North-South divide on forests – a divide that had torpedoed a convention on forests back at the time of the Rio Earth Summit – were coming to a successful conclusion. Since we got started on the book, even more pieces have fallen into place, such as the cascade of commitments by corporations to get deforestation out of commodity supply chains. Mongabay: Under the Paris Agreement (UN Framework Convention on Climate Change), REDD+ was formally adopted into the global climate framework. What’s needed now to move REDD+ forward? Seymour: Our view is that large-scale results-based finance is the missing piece. The key attribute that makes REDD+ different from previous decades of funding for forest conservation is the promise of performance-based finance at scale. But as documented in our book, available funding has hovered around $1 billion per year – the same level as pledged under the Tropical Forestry Action Plan some 30 years ago – and less than half of that has been allocated for result-based payments. While it’s true that many forest-rich countries will continue to need support for capacity-building and investment, few are likely to be effective in reversing the drivers of deforestation-as-usual without the certainty of significant financial reward for success. Mongabay: With the Trump Administration coming to power, what’s your outlook for international forest policy? What countries are leading the forest policy? Seymour: While it would be deeply unfortunate if the United States were to disengage from international forest and climate policy, other countries such as Norway, the United Kingdom, and Germany will likely continue to exercise leadership. In addition, sub-national jurisdictions such as the state of California and international organizations such as the International Civil Aviation Organization are in discussions about creating demand for reduced deforestation by including international forest offsets in their emissions reduction programs. Forest-rich countries such as Brazil, Colombia, and Indonesia are increasingly recognizing that protecting forests is in their own national self-interest, so will continue to be motivated to participate in relevant international fora. Mongabay: What are the most effective interventions for arresting deforestation? Seymour: Brazil demonstrated the effectiveness of a number of policy tools when it brought down the rate of forest loss it the Amazon by some 80 percent in the decade starting in 2004. Those tools included establishment of protected areas along the “arc of deforestation,” recognition of indigenous territories, and enhanced law enforcement aided by near real-time monitoring of deforestation events via satellite. A voluntary soy industry moratorium on sourcing from recently deforested land, and government restrictions on access to credit in high-deforestation municipalities also contributed to Brazil’s success. A meta-analysis conducted by my colleagues Jonah Busch and Kalifi Ferretti-Gallon illuminated the significance of other factors; for example, general rural income support payments are associated with more deforestation; while payments for environmental services is associated with less. Mongabay: How important are consumers in driving a shift away from business as usual? Seymour: Currently the leading cause of tropical deforestation is industrial-scale clearing of forests to produce globally-traded commodities such as beef, soy, palm oil, and fast-growing timber for pulp and paper, and much of that clearing is illegal. If consumers demand that such “forest-risk” commodities be legally and sustainably produced, that sends a signal to producers – as well as to governments in producer countries – that improved performance will be rewarded with preferential access to markets. Governments in consumer countries can help by establishing procurement standards for legality and sustainability, and remove perverse subsidies for bioenergy that is produced from forest-risk feedstocks. Mongabay: What do you see as the biggest obstacles to reducing deforestation? Seymour: Locally, there are many obstacles to reducing deforestation that are due to weak forest governance, especially the lack of clear land tenure, and corruption in the granting of permits for forest exploitation and conversion. But at the international level, a huge obstacle is the lack of awareness among policy-makers that forests – the only safe, natural, and proven technology for carbon capture and storage – are essential to achieving the goals of the Paris Agreement, and that action is urgent, feasible, and affordable. As a result, forests get less than their “fair share” of climate finance and political attention. Mongabay: Beyond carbon, is there an opportunity to highlight the economic importance of forests in generating rainfall and cooling local temperatures? Seymour: Absolutely. Evidence continues to accumulate regarding the significant roles forests play in providing ecosystem services such as influencing rainfall and cooling local temperatures. Those services are critical to achieving the Sustainable Development Goals [a UN initiative to end poverty, protect the planet and ensure prosperity for all] related to hunger and poverty, health, energy, water, and safety from natural disasters. Now that we have better data on forest cover change, it will be possible to do more sophisticated economic analyses of, for example, the contribution of forests to agricultural productivity at landscape scales, the relationship between forest cover change and the incidence of malaria, and the value of forested watersheds to filling reservoirs behind hydroelectric dams with clean, sediment-free water. Mongabay: What are the opportunities for reforestation and forest restoration in helping mitigate climate change? Seymour: The opportunities to promote both climate and development objectives through reforestation and forest restoration are large, and international initiatives such as the Bonn Challenge [a global effort to restore hundreds of millions of hectares of the world’s deforested and degraded land over the next 15 years] have been launched to capture them. However, those opportunities should not be a distraction from the urgent imperative of keeping the forests we have standing. After an area of tropical forest is cleared and burned, it can take more than 100 years to re-establish the carbon stock that was released into the atmosphere over only a few days, not to mention the cost of all the biodiversity and ecosystem services values that are lost in the meantime.